BATON ROUGE, Louisiana, December 15, 2010 (ENS) – Independence Island in Louisiana’s Barataria Bay was once a popular fishing destination, but due to coastal erosion and subsidence, the island has sunk so low it is no longer a viable fisheries habitat. Then this spring and summer, low-lying islands in the bay were heavily oiled by BP’s Deepwater Horizon spill. But the island will be restored this spring, Governor Bobby Jindal announced Tuesday, as the result of a new partnership between the recreational angling community, private businesses and the state. Governor Jindal joined the nonprofit Coastal Conservation Association and Shell Oil Company to announce that the partners will fund CCA’s ongoing Building Conservation Habitat Program, and one of the first projects will be building reefs to provide fish habitat at Independence Island. Shell has committed 1.5 million dollars to CCA’s Building Conservation Habitat Program. The nonprofit organization has 15 coastal state chapters spanning the Gulf of Mexico and the Atlantic seaboard. The Independence Island Reef will be funded by a $250,000 donation from the CCA Building Conservation Habitat Program and matching funds from the state. An explosion on BP’s Deepwater Horizon oil rig in April and the resulting 4.1 million barrel oil spill into the Gulf of Mexico happened just 50 miles off the Louisiana coast. Finally capped in July, the worst offshore oil spill in American history fouled hundreds of miles of shoreline from Texas to Florida. 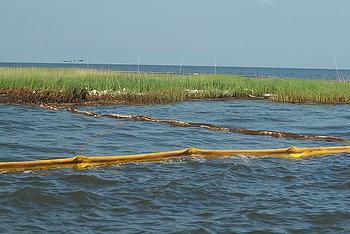 Louisiana’s Barataria Bay was heavily oiled. Coastal Conservation Association worked with the Louisiana Department of Wildlife and Fisheries to permit a 55-acre site for future reef development that includes the original footprint of Independence Island. The Independence Island project will install two reefs covering four acres at Independence Island this spring, each reef consisting of 3,500 tons of limestone to provide hard-structure habitat for marine fisheries. Almost immediately after installation, these reefs are expected to start attracting marine organisms and forage fish, which will draw recreational species and provide new opportunities for anglers in Grand Isle. After the massive BP oil spill, petroleum companies are eager to show their greener side. “CCA members have an amazing track record of conservation work that sets them apart. We believe in the organization and are committed to doing our part to ensure that the Building Conservation Habitat Program has the tools to bring significant marine habitat restoration projects from concept to reality,” said Hollowell. CCA has constructed reefs in Lake Pelto, Vermilion Bay, Calcasieu Lake, and Lake Ponchartrain. For in-shore coastal areas, this program has used crushed limestone to construct low-relief “shell-pad” type structures to enhance habitats and fisheries resources.